by Kafka, which I’d read when I was 16 years old. Even now I have a distinct memory of its absurd story in which a human creature is transformed into an insect. I thought that this story’s theme would match Archimboldo’s painting style. 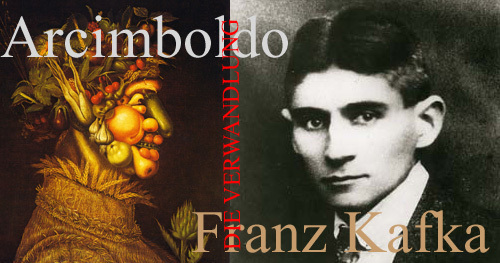 This work is a fusion of the two worlds produced by Archimboldo and Kafka, and homage to them. First I produced insect models to constitute the nose, eyes, and mouth, since they are at the center of the face. Then I added other parts: the head, cheeks and ears while coordinating the balance of shape. 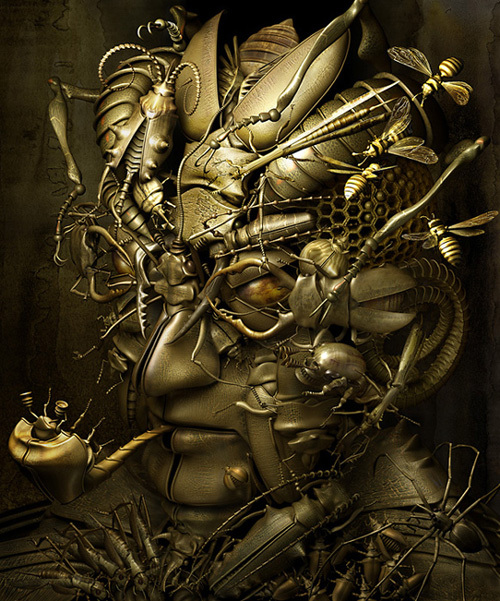 The species and number of insects used in this work were determined one by one after judging the results of test renderings. 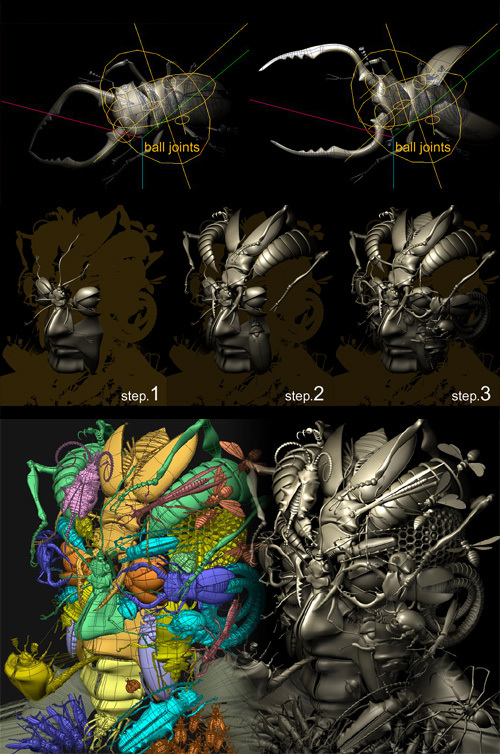 All the shapes were modeled on curved surfaces using 3D program ‘Shade 7', which was produced in Japan. Since the shape of even a single insect is complex, it was necessary to conduct fine adjustments many times to cope with the knotty superimposition of their legs, horns, and antennas. I set ball joints at the bases of insects' wings to make it possible to change their postures freely. By changing the combination of each insect model I obtained the optimum angles and sizes. The processes of the production were just like assembling a 3D jigsaw puzzle. When determining the texture of “Metamorphosis“ the problem I considered most was tha when every insect model has very different colorations and textures, the whole impression which should be seen as a human face, becomes vague. To deal with this problem I put a basic crack pattern texture onto all the models, and examined the balance of coloration and shading. After that, I put a specific texture on each insect model. The abovementioned procedures were conducted by super-imposing rendering images using Photoshop and then conducting fine adjustments of coloration and texturing, which is similar to the process of oil painting in which color is added little by little with a brush.